State of Literature or State of Mind? 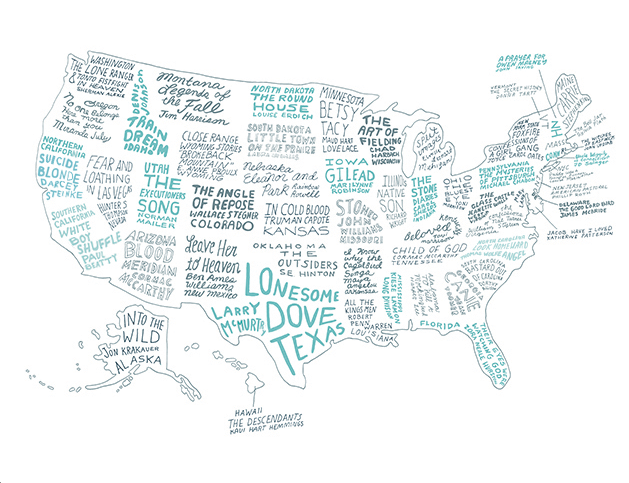 I ran into this self-proclaimed “Literary United States: A Map of the Best Book for Every State”, published in the Brooklyn Magazine last week. I know this list isn’t supposed to represent each state in its entirety but portray some specific portion which will “make us understand a time and place in a more profound way than you thought possible.” But I have to wonder, if the other books are as extreme as Child of God, do some of these books represent any state (geographic or state of being) at all? Or maybe this is just some frightening revelation of the opinion of some New Yorkers about the South? A land known, I guess, primarily for its deviant sexual practices (don’t forget all those old jokes about inbred families up in them thar hills), violent racism (yes, part of our heritage, but not ours alone, and not all we are), and hot buttered biscuits (I concede the omnipresence of these). To the day she died, my mother still recounted how, when she attended Harvard in the ’50s on a Ford Foundation Grant for creative writing, she was teased mercilessly about the fact that she , a “hillbilly”, actually wore shoes (she was born in South Carolina and grew up in NC). Nor had she ever quite gotten over the fact that she was treated “up there” as somewhat less-than-intelligent because she talked with an accent. Hey, Northerners, that was over 50 years ago. And you’re still not seeing past the stereotypes? (Well, actually, I encountered quite a few while “up there” in the 70s and 80s). Ah, these United States. Still not quite. Oh, my questions could go on and on. North Carolina’s choice, for instance. Sure, Thomas Wolfe is a great writer and native son and obvious candidate here. But I would also suggest someone like mystery writer Margaret Maron, whose books set in the Piedmont capture contemporary Carolina culture, where rural and citified, black and white, thrive, despite minor tensions. And how could any serious list have excluded Nebraska’s brilliant Willa Cather? I am glad to see children’s books represented by Laura Ingalls Wilder and Maud Hart Lovelace, both of whose series still line my shelves and always will. Thank you for that, Brooklyn Magazine. Not trying to incite a war between the states here. But–maybe try again? What book(s) would you suggest to represent your state? This entry was posted in literature and tagged literature, Margaret Maron, Tennessee on October 21, 2014 by Margaret.